President Jacob Zuma congratulated distinguished South African scientist Prof. Tebello Nyokong for winning the African Union (AU) award for her cutting-edge research. The Rhodes University professor has been actively involved in ground breaking research in applying nanotechnology as an alternative treatment to chemotherapy since 2007. Nyokong is the director of the Nanotechnology Innovation Centre, a national science facility established by the Department of Science and Technology in 2007. “I had an opportunity to stress the importance of science to the leaders of the continent. They may not listen to me, but I had to do it,” she said. Prof. Nyokong is making use of “photo-dynamic therapy” as an alternative to chemotherapy. The new therapy is based on using the dye which is used to colour blue denim clothing. According to Nyokong’s research the dye is inert and harmless by itself but can be activated by exposure to a red laser beam. The therapy is said to have fewer side effects than chemotherapy because the treatment does not destroy healthy cells or cause nausea and hair loss. Nyokong was awarded the prestigious R 1.5 million AU Kwane Nkrumah scientific award, which is handed out annually to an African scientist who has done ground breaking research in the fields of science, technology and innovation. Zuma applauded Nyokong for making great strides towards effective cancer treatment, as well as contributing significantly in the fields of science and technology, skills development and for supporting innovation within South Africa. Zuma stressed the importance of African governments investing in science and technology, explaining that it would lead to home-grown solutions to many socio-economic and developmental challenges facing the continent, ultimately making the continent a better place for its inhabitants. 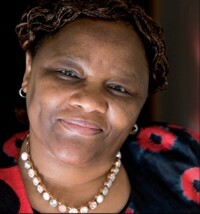 Prof. Tebello Nyokong was born in Lesotho in 1951. In 1977, she graduated from the National University of Lesotho with an MSc in chemistry in 1981, then received a PhD from the University of Western Ontario in 1987. Prof. Nyokong briefly lectured at the University of Lesotho before joining Rhodes University in 1992 as a lecturer. She has published 450 papers, including book chapters and filed a patent. Rhodes University vice-chancellor, Dr Sizwe Mabizela, praised Nyokong saying she represented the institution with great honour and distinction. “We are delighted with Professor Nyokong being recognised yet again as a truly outstanding scientist. We all burst with pride at the stellar achievements of one of our own,” he explained.